Bishop's Stortford College is proud to be a founding member of the Bishop’s Stortford Educational Trust. As part of the residential development of Bishop’s Stortford North, two new state primary schools and a state secondary school are planned to accommodate pupils from Reception to the Sixth Form. These schools are to be set up and managed by a Multi Academy Trust: a consortium of organisations acting as Sponsors. The Sponsors have the responsibility for establishing and appointing the directors of the Trust and will therefore be instrumental in setting the vision for the new schools. The work of the Trust will be entirely funded by the Department of Education and once the new schools are up and running they will operate independently of the Sponsors. To visit the trust website and for further information about the Trust please click here. Train to be a teacher with us! Our school works in partnership with the Bishop’s Stortford Educational Trust School Centred Initial Teacher Training to offer superb Initial Teacher Education (ITE) to graduates and career changers joining the teaching profession. As a trainee teacher with us, you will have access to outstanding training, school and classroom experience to equip you with the knowledge, skills and expertise that you will need to become an excellent teacher. 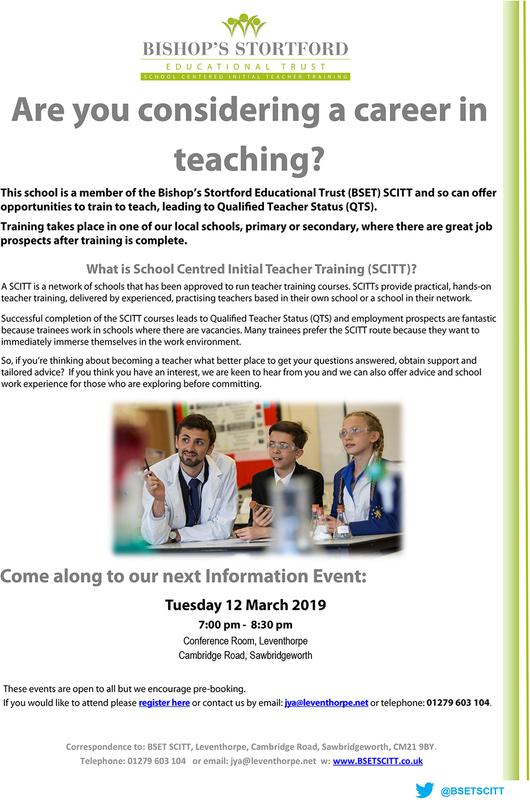 Click here to visit our website for further information about teacher training with the Bishop’s Stortford Educational Trust School Centred Initial Teacher Training (SCITT).